For the best part of 25 years, anyone on a budget who felt an urge to roam the homeland of Robert Burns could book themselves into the Turnberry caravan park on the rugged west coast of Scotland. But this year, the latest owners of the Turnberry Holiday Park found it had not been growing as quickly as they had hoped when they bought it at the end of 2012. After surveying more than 1000 people, they made an unpleasant discovery: nearly a third would be less likely to visit because they thought the park had something to do with the nearby Turnberry golf resort that Donald Trump bought in 2014. Andrew Howe, chief executive of the group that owns the park, said last week the “negative element of the Donald” meant that “annoyingly” the name might have to change. If it does, it will be a rare example of an entirely understandable decision to rebrand. 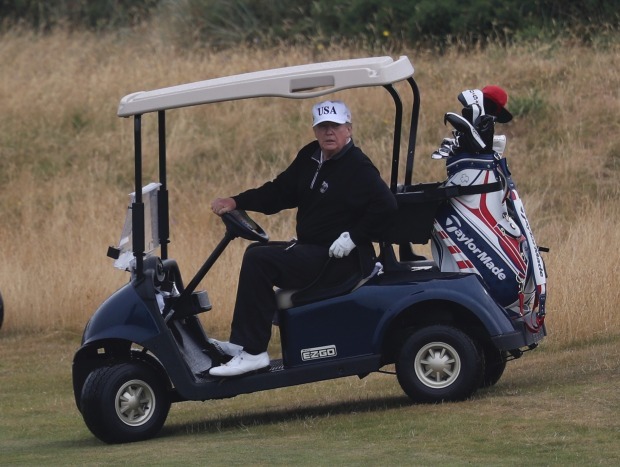 Donald Trump’s Turnberry golf club is not connected to the nearby Turnberry caravan park. Of all the efforts businesses make to improve themselves, the corporate makeover is almost always among the most baffling. This has been evident from the spate of appalling rebranding announcements in the past few weeks, and the many that preceded them. It should be obvious by now that the only thing a rebrand absolutely guarantees is that money will be spent, often in staggeringly large lumps. When BP unveiled the makeover that produced its “exploding sunflower” logo nearly 20 years ago, the FT coolly reported the oil company had “spent $7 million on research and design, and plans to increase its advertising budgets by about $25 million a quarter over the next few quarters to support the exercise”. Another bewildering amount was doubtless paid by Dunkin’ Donuts, which last month declared it had become just Dunkin’, a verb forever in search of a noun. That news came as the 55-year-old Weight Watchers, eager to be associated with the faddish wellness movement, said it was changing its name to WW, two letters that take twice as long to pronounce as the old name and are widely understood to mean World War. It would be one thing if there were overwhelming proof the money lashed out on rebranding is always well spent. Yet the evidence is mixed. Researchers have spent decades looking at what a rebrand does to a company’s performance and a number have arrived at the same conclusion: not much. Studies suggest the effect of a rebranding announcement on a company’s share price can be positive around the time it is made, but in the long-term it can be hard to find a link at all. The news is better for insurers. At least one report has detected an association between a name change and a rise in premiums. But this year, a larger US analysis of more than 200 rebranding announcements in 101 industries delivered more sobering findings. News of a rebrand was linked to an average rise of 2.46 per cent in stock prices, but in more than 40 per cent of cases, the announcements were followed by “negative abnormal returns”. In other words, a rebrand might help financially. Or it might not. Age seems to matter: the researchers warned managers should be especially cautious about abandoning a long-standing brand name or logo. Considering the risks, one might expect that rebranding devotees would at least devise new names that avoid public ridicule. Alas, a surprising number do not. Few manage to rename themselves after a venereal disease, as NBC’s Sci Fi channel did some years ago when it rebranded itself “Syfy” – slang for the plural of syphilis in Poland. But too many go for an awful non-word like “Refinitiv“, the new name for the trading and data business recently spun out of Thomson Reuters. And an alarming number produce something so bad it leads to an embarrassing reversal. Two weeks ago, the tronc Inc newspaper company that owns the Chicago Tribune and other papers said it was scrapping its much-mocked name and reverting to the sensible title it ditched just two years earlier: Tribune Publishing. This was by no means the first pivot of its kind. I doubt it will be the last. In the meantime, any company that sticks to a name that is meaningful, legible and simple will always have my vote.